"SFDA is cracking down on illegal food additives and strictly regulating their usage". Food safety incidents in China have received increased international media scrutiny following the reform and opening of the country, and its joining the World Trade Organization. Urban areas have become more aware of food safety as their incomes rise. Food safety agencies in China have overlapping duties. 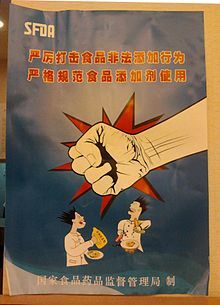 The 2008 Chinese milk scandal received the most attention among food safety incidents. In 2003, several small producers of Jinhua hams (from Jinhua, Zhejiang) operated out of season and produced hams during warmer months, treating their hams with pesticides to prevent spoilage and insect infestation. The hams were soaked in the pesticide dichlorvos, which is a volatile organophosphate insecticide used for fumigation. In April 2004, at least 13 babies in Fuyang, Anhui and 50–60 more in rural areas of Anhui died of malnourishment from ingesting fake powdered milk. In addition, 100–200 other babies in the province suffered malnutrition but survived. Local officials in Fuyang arrested 47 people who were responsible for making and selling the fake formula and investigators discovered 45 types of substandard formula for sale in Fuyang markets. Over 141 factories were responsible for the production of the formula and Chinese officials seized 2,540 bags of fake formula by mid-April. The State Food and Drug Administration ordered an investigation in May, 2004. Within three days of ingesting the formula, the babies suffered from what Chinese doctors described as "big head disease," since the babies' heads swelled while their bodies became thinner from malnourishment. The fake formulas were tested to have only 1-6% protein when the national requirement was 10% protein. The government promised to compensate families and help cover medical bills. Most of the victims were rural families. In June 2004, the Chengdu Quality Inspection Department released figures that only about 23% of all pickled vegetables produced in Chengdu, Sichuan had an acceptable amount of chemical additives. The labels on the pickled vegetables that was supposed to indicate the chemical content were also found to be inaccurate. In Sichuan, the factories had been using industrial-grade salt to pickle the vegetables and had been spraying pesticides containing high amounts of DDVP on the pickled vegetables before shipment. In spring 2004, four men died of alcohol poisoning in Guangdong and eight other men were hospitalized in the People's Hospital of Guangzhou. Wang Funian and Hou Shangjian, both from Taihe Town, died in May after drinking liquor bought from the same vendor. Two other men, one a migrant worker, died the previous night in Zhongluotan in Hunan. Authorities in the local health department suspected that the makers of the fake liquor blended industrial alcohol and rice wine, and closed several unlicensed liquor manufacturers. In response, the Chinese government banned production of soy sauces made from hair. Other carcinogens remain; see 3-MCPD. In 1996, China banned food manufacturers from using Sudan I red dye to color their products. China followed a number of other developed nations in banning the dye due to its links to cancer and other negative health effects. However, officials in the General Administration of Quality Supervision, Inspection and Quarantine, the State Bureau of Industry and Commerce, and the State Food and Drug Administration discovered in 2005 that Sudan I was being used in food in many major Chinese cities. In Beijing, the Heinz Company added the red dye to chili sauce; in Guangdong, Zhejiang, Hunan, and Fujian, the red dye was discovered in vegetables and noodles. Kentucky Fried Chicken (KFC) used the red dye in its 1,200 restaurants, and medicine in Shanghai also contained Sudan I. Before the year 2005, companies in China had been using Sudan I illegally, and government officials gave two reasons why the 1996 ban had not been adequately enforced. The first reason was that there were too many agencies overseeing food production, creating loopholes and inefficiency. The second reason was that the government agencies were not equipped or trained with the food testing equipment that could have detected the dye earlier. Officials announced that they would begin to reform the food safety system on national and local levels. The State Food and Drug Administration reported that their officials had resolved 14 cases involving fake drugs and 17 cases involving "health accidents" at drug manufacturing facilities. One of these incidents involved fake Armillarisni A; ten people injected with the fake drug died in May, 2006. The drug quality inspectors at the factory that produced the Armillarisni A drugs failed to notice that the chemical diglycol had been added to drugs. In July, 2006, six people died and 80 more became sick after ingesting an antibiotic with disinfectant as an ingredient. In 2006, the government also "revoked the business licenses of 160 drug manufacturers and retailers." On September 1, 2006, more than 300 students at Chongzhou Experimental Primary School in Chongzhou, Sichuan got food poisoning after lunch. Of those, approximately 200 students had to be hospitalized due to headaches, fevers, vomiting, and diarrhea. The school was temporarily closed for an investigation. On the same day, middle school students in Liaoning also got food poisoning after eating dinner at school. The Ministry of Education ordered an investigation, and officials suspected that the cause of the food poisoning was unsanitary conditions at the schools. During summer vacation, the schools had not been cleaned or disinfected, and the pupils might have been exposed to unsanitary food or drinking water when they returned in September. In late 2006, officials in Shanghai and Beijing discovered illegal amounts of chemicals in turbot. As The Epoch Times explained, "China started importing turbot from Europe in 1992. Currently, China's annual output is 40,000 tons. Since turbot have weak immune systems, some farmers use prohibited drugs to maintain their productivity, as their fish-farming technologies are not sufficient to prevent disease." Shanghai officials from the Shanghai Food and Drug Administration found carcinogenic nitrofuran metabolites in the fish and Beijing found additional drugs, including malachite green, in its fish. Other cities, including Hangzhou, Zhejiang, have begun testing turbot fish and banning the turbot shipped from Shandong. Many restaurants in Shanghai, Beijing, and Hong Kong stopped purchasing turbot after officials discovered the high amounts of illegal antibiotics. In early 2006, Greenpeace tested vegetables in two Hong Kong grocery stores, and discovered that only 30% of their samples contained acceptable amounts of pesticide residue. Some of the 70 percent failing the tests tested positive for illegal pesticides, such as DDT, HCH and Lindane. Greenpeace explained that nearly 80% of vegetables in these grocery stores originated from mainland China. John Chapple, manager of Sinoanalytica, a Qingdao-based food analysis laboratory, supplemented Greenpeace's information. He was not surprised by the findings and explained that farmers in China have little knowledge of correct pesticide use. Although many Chinese farms are converting to organic agriculture, pesticide use in many areas remains high. In June, July, and August 2006, the Shuguo Yanyi Restaurant in Beijing served raw Amazonian snail meat and, as a result, 70 diners were diagnosed with angiostrongylus meningitis. The snail meat contained Angiostrongylus cantonesis, "a parasite that harms people's nervous system" causing headaches, vomiting, stiff necks, and fevers. No one died from the meningitis outbreak and the Beijing Municipal Office of Health inspection did not find any more raw snails in 2,000 other restaurants. However, the Beijing Municipal Office of Health prohibited restaurants from serving raw or half-cooked snails and disciplined the Shuguo Yanyi Restaurant. The Beijing Friendship Hospital, where the first meningitis case was treated, began a program to educate doctors on the treatment of angiostrongylus meningitis. The Guangzhou Center for Disease Control and Prevention explained that these meningitis cases were the first outbreaks since the 1980s. In December 2006, sixteen diners were hospitalized after eating a poisonous variety of boletus mushrooms in Beijing at the Dayali Roast Duck Restaurant. The mushrooms caused nausea, vomiting, and dizziness and the ill diners were treated at the Bo'ai Hospital and the 307 Hospital of the People's Liberation Army. In November 2006, Chinese authorities at the Ministry of Health had warned of the rising number of mushroom poisonings. "From July to September, 31 people were killed and 183 were poisoned by toxic mushrooms." Officials worried that the public could not accurately separate edible mushrooms from poisonous ones. According to John Newton of Interpol, Chinese organized crime is involved in working across national boundaries and faking drugs on an industrial scale, now appearing throughout Africa. China Central Television cited an official saying those making the false albumin were making a 300% profit, assisted by shortages of the genuine product. In March 2007, the Guangzhou Information Times accused Kentucky Fried Chicken (KFC) of adding oil filtering powder, magnesium trisilicate, to its frying oil. It reported that KFC restaurants in several cities in Shaanxi added this chemical so that the frying oil could be used repeatedly for up to ten days. KFC pointed out that the additive is considered safe by United States and international standards, but health officials in Xianyang, Yulin, and Xi'an, inspected their local KFCs and confiscated the frying powder. Officials in Guangzhou also began in investigation into the frying oils, and the cities requested that the Ministry of Health step in. KFC stated that the oil filtering powder does not cause health problems and meets local and international standards, but local Chinese authorities claimed that reusing the powder decreased its nutritional value and that it was connected to cancer. Magnesium trisilicate is commonly used in medicines such as antacids, and is widely considered to be safe for human consumption with no known connections to cancer. In May 2007, The General Administration of Quality Supervision, Inspection, and Quarantine (AQSIQ) confirmed that two domestic companies had exported melamine-contaminated wheat gluten and rice protein blamed for the deaths of dogs and cats in the United States. In August 2007, AQSIQ introduced recall systems for unsafe food products and toys and on December 3, 2007, China ordered 69 categories of products to be bar-coded at factories amid efforts to improve product safety, in response to several recent incidents, including: "scares rang[ing] from ducks and hens that were fed cancer-causing Sudan Red dye to make their egg yolks red, to pet food made of melamine-tainted wheat protein that killed scores of dogs and cats in the United States." See also 2007 pet food crisis. Close to a hundred manufacturers of stinky tofu in Guangdong were found to use a combination of sewage, slop, and iron(II) sulfate to accelerate production and improve appearance of their fermented product. In January 2008, several Japanese people in the Hyōgo and Chiba prefectures fell ill after consuming Chinese-produced jiaozi (dumplings) tainted with the insecticide methamidophos. The dumplings had been produced by the Tianyang Food Plant in Hebei and sold by JT Foods and the Japanese Consumers' Co-operative Union. Kyodo News reported that about 500 people complained of symptoms such as nausea and stomach pain. On February 5, 2008, Hyōgo and Chiba prefectural police announced that they were treating these cases as attempted murder. and both prefectural police departments established a joint investigation team. When Japanese police and other prefectural authorities inspected the recalled dumplings, they found pesticides other than methamidophos, including dichlorvos and parathion. The Japanese National Police Agency found these toxins in packages that were completely sealed, concluding that it would have been nearly impossible to insert such toxins into the packages from the outside. They provided the test results to the Ministry of Public Security of China (MPS). Investigations jointly held by both the Chinese and Japanese governments cleared the Chinese company of responsibility after finding no traces of any poison in the raw material used nor in the factory. Officials are now treating this incident as a deliberate poisoning, and an investigation is underway. On February 28, 2008 the MPS criminal investigation bureau announced that there was little chance that methamidophos had been put into the dumplings in China, and declared that the Japanese police had rejected the requirement by the MPS to check the scene, relative material evidences, and test reports, thus information on the evidence was not fully provided to the MPS. On the same day, Hiroto Yoshimura, the Commissioner-General of Japan's National Police Agency, argued against the Chinese authorities that the Japanese had already offered test results and photographic evidence and claimed that some part of China's assertion "cannot be overlooked". They asked Chinese authorities to offer evidence. On August 5, 2008, Japanese media revealed that some Chinese people who had eaten the recalled Chinese dumplings made by Tianyang Food had also become sick after the incident in Japan, in mid-June 2008; the cause was again found to have been methamidophos contamination. The Chinese government alerted the Japanese government to this fact just before the 34th G8 summit in July 2008. The Yomiuri Shimbun reported that this incident has increased the suspicion of foods produced in China. In July 2008, it was announced that the Whole Foods supermarket chain in the United States had been selling powdered ginger produced in China, which was labeled as organic food, but when tested was found to contain the banned pesticide Aldicarb. The ginger had been mistakenly certified organic by Quality Assurance International, who relied on two Chinese certifiers because, under Chinese law, foreigners may not inspect Chinese farms. In September 2008, a fresh outbreak of kidney disease occurred, due to baby formula contaminated by melamine. Six babies died and 54,000 were made sick by the tainted formula with 51,900 requiring hospitalization. The supplier of the milk, Sanlu Group, is a name brand and is a major player in the industry in China. The company is said to have known of the problem for months, but claims the contaminant came from milk suppliers. In October 2008 news emerged certain egg products produced by Hanwei Group were also contaminated with melamine. Tapioca pearls used for bubble tea were adulterated with macromolecular polymers to improve their texture. To improve the chewiness and texture of mantou (steamed buns) the pesticide dichlorvos was added. In addition, sulfur dioxide was used to whiten the buns to improve their physical appearance. Businesses in Qingdao, Shandong have been caught marinating duck meat in goat or sheep urine to give the duck the smell and taste of lamb. The duck is then sold as lamb to customers. Inspectors in Wuhan, Hubei discovered that most of the pork blood pudding in Chinese markets contained little actual blood, but rather, was manufactured with formaldehyde, corn starch, industrial grade salt, artificial food colourings, and a variety of other additives. Hunan police shut down various underground workshops that produced fake green beans by mixing soybeans with various chemical additives. Seventeen noodle makers in Dongguan city, Guangdong province alleged to have included ink, industrial dyes, and paraffin wax in the manufacture of noodles normally made from sweet potatoes in order to lower costs. In October 2012, frozen Chinese strawberries contaminated with norovirus infected over 11,000 children in Germany. In March 2013, over 15,000 dead pigs had been found drifting down Huangpu River, caused by a crack-down on illicit pig-trade in Zhejiang. As reported by Shanghaiist, local pork dealers would buy up dead meat unfit for sale, process it in illegal workshops, and then re-introduce the products into the legal market. In May 2013, the Ministry of Public Security released a press statement warning Shanghai consumers of lamb meat that inadvertently may have been, or contained, rat, fox or mink meat. According to some sources, respective fake lamb meat also reached Yum-owned "Little Sheep" hot pot chain restaurants, though Yum itself declined these rumours. In June 2013, Wenzhou police shut down 10 underground mills in Zhejiang’s Cangnan County, and additionally seized large amounts of chemical additives and coloring agents, which were used to clean expired chicken drumsticks and wings, ducks’ heads, and duck meat prior to re-selling them to the public. In September 2013, according to JRJ and Shanghaiist six workshops near Xi'an, Shaanxi, have been shut down that produced fake beef by mixing pork with chemicals, such as paraffin wax and industrial salts. In October 2013, cat meat, slaughtered at a "black" slaughterhouse in Huai'an City near Shanghai, was sold to butchers and local markets under the guise of “rabbit”. Some of the cats were kept alive and shipped to the southern provinces of Guangdong and Guangxi where they were sold for around 10 yuan (£1) per animal. Gutter oil is a term used in China to describe illicit cooking oil that has already been used and is then processed by cleaning and filtering to be resold as a cheaper alternative to normal cooking oil. The sources of this oil are restaurant fryers, sewers and leftover or used oil that is sold by restaurants. A newer version of gutter oil uses discarded animal parts, animal fat, internal organs, and expired or otherwise low quality meat which is then cooked in large vats in order to extract the oil. Shanghai Husi Food Co. Ltd. supplied products containing expired meat to McDonald's, KFC, Pizza Hut, Starbucks, and Burger King. The products were sold in numerous countries including Japan. Pizza Hut's and KFC's parent Yum! Brands, Inc. apologized to Chinese customers after the scandal was exposed. Shanghai Husi Food Co Ltd based in China was a subsidiary of U.S.-based OSI Group LLC. The company was forced in July 2014 to shut down after local television station Dragon TV ran footage of the company's factory workers picking meat such as hamburger patties from off the factory floor and throwing them directly into meat mixers, and handling poultry and beef on the assembly line with their bare hands. The footage also showed sewage and trash spread all over the floor of the plant. In addition, the expired meat, which workers described as "stinky," was concealed mostly by mixing it with non-expired meat. A video about the top 10 most common toxic substances in Chinese food and snacks looked into the use of the carcinogen, sodium formaldehyde sulfoxylate (CH3NaO3S), to bleach food. According to the video, this practice has been widely adopted by the largely unregulated Chinese food industry. In the video, all 12 samples taken from mianjing snack stalls in Beijing were found to contain CH3NaO3S. Mushrooms, tofu, mianjing (a Chinese starch product), mixian (mainly rice made noodles), vermicelli, and flour were among the food that contained contaminated substances. Bean and starch products were also found contaminated with CH3NaO3S. A video made by a Chinese dietitian has become popular on Internet showing a commonly adopted way to turn boiled water into "high quality pork soup" for hot pot. By adding ethyl maltol, capsicum oleoresin, and Disodium 5’-ribonucleotide into boiled water, fake pork hot pot soup becomes ready to serve in 20 seconds. As investigators dug deeper, it was revealed to the public that many cooks of hot pot restaurants took training programs in China that approved the fraud to reduce cost. Investigators also found antimalarial drugs in the soup to cover the side effects of rotten meat. In the same video, the dietitian also showed a common method to make “beef balls” from bean powder by adding sodium pyrophosphate (Na4P2O7·10H2O) and sodium tripolyphosphate (Na5P3O10). ^ "Carcinogenic Turbot Fish Affects China's Market". The Epoch Times. December 2, 2006. Archived from the original on January 9, 2009. ^ McGivering, Jill (June 4, 2007). "Chinese Gangs Behind Fake Drugs". BBC News. Retrieved 2007-06-19. ^ "Chinese Hospitals Used Fake Drips". BBC News. June 11, 2007. Retrieved 2007-06-19. ^ Gao, Ying (July 10, 2007). "China names and shames companies for exporting substandard food products". Xinhua. Retrieved 2007-12-02. ^ Yao, Siyan (August 31, 2007). "China unveils recall systems for unsafe food, toys". Xinhua. Archived from the original on October 12, 2012. Retrieved 2007-12-02. ^ Sun, Yunlong (December 4, 2007). "China orders bar codes for safety monitoring of 69 product categories". Xinhua. Retrieved 2007-12-10. ^ "黑心臭豆腐 糞水泡製". 蘋果日報. 2007-07-14. Archived from the original on 2008-01-12. Retrieved 2007-07-14. ^ "10 sick after eating tainted 'gyoza' from China". Japan Times. January 31, 2008. Retrieved 2008-01-31. ^ "10 fall ill after eating frozen 'gyoza' made in China". Asahi Shimbun. January 31, 2008. Archived from the original on 2008-03-06. Retrieved 2008-01-31. ^ "10 fall ill after eating Chinese-made dumplings containing insecticide". Mainichi Shimbun. January 31, 2008. Archived from the original on 2008-02-03. Retrieved 2008-01-31. ^ "62 more victims uncovered in poisoned dumpling case". Mainichi Shimbun. January 31, 2008. Archived from the original on 2008-02-01. Retrieved 2008-01-31. ^ "China-made dumplings sicken 10". Yomiuri Shimbun. February 27, 2019. Archived from the original on 2019-02-27. Retrieved 2019-02-27. ^ "Food Huntz". Reuters. February 27, 2019. Retrieved 2019-02-27. ^ "Food Huntz". Melbourne: The Age. 2008-02-01. Retrieved 2008-03-09. ^ "Pesticide on more dumpling packages". Asahi Shimbun. 2008-02-11. Archived from the original on 2008-02-12. Retrieved 2008-08-06. ^ "Japan police find more pesticide on China dumpling packages". AFP. 2008-02-03. Archived from the original on 2008-04-10. Retrieved 2008-08-06. ^ "'Gyoza' in Miyagi yields new pesticide". Japan Times. 2008-02-22. Retrieved 2008-08-07. ^ "Pesticide found inside sealed 'gyoza' package". Asahi Shimbun. 2008-02-09. Archived from the original on 2008-03-16. Retrieved 2008-08-07. ^ "Top Chinese Official Tries to Calm Food Fears in Japan". Dow Jones Newswires. 2008-02-21. Archived from the original on October 7, 2008. Retrieved 2008-08-07. ^ "Pesticide in 'gyoza' unlikely Japan's". Asahi Shimbun. 2008-02-18. Retrieved 2008-08-07. ^ "Japan, China officials discuss 'gyoza' scare". Asahi Shimbun. 2008-02-22. Archived from the original on 2008-04-01. Retrieved 2008-08-07. ^ "Japan: China dumpling poisoning may be deliberate". Reuters. February 5, 2008. Retrieved 2008-02-08. ^ "Factory not at fault in Dumpling Poisoning?". To The Center. February 5, 2008. Retrieved 2008-02-08. ^ "Factory not at fault in Dumpling Poisoning?". Japan News Review. February 5, 2008. Retrieved 2008-02-08. ^ "State watchdogs: dumpling poisoning is case of sabotage". Xinhua. 2008-02-28. Retrieved 2008-02-29. ^ "Beijin pins 'Gyoza' blame on Japan end". Japan Times. 2008-02-29. Retrieved 2008-08-07. ^ "China deflects blame in Japan dumpling row". Agence France-Presse. 2008-02-27. Archived from the original on 2008-05-16. Retrieved 2008-08-10. ^ "Consumer in China also suffered food poisoning after eating dumplings". Mainichi Shimbun. 2008-08-06. Archived from the original on 2013-02-18. Retrieved 2008-08-06. ^ "Tainted "gyoza" sicken Chinese". Asahi Shimbun. 2008-08-07. Archived from the original on September 19, 2008. Retrieved 2008-08-07. ^ "China 'gyoza' poisonings hushed up". Japan Times. 2008-08-07. Retrieved 2008-08-07. ^ Fujioka, Chisa (2008-08-07). "Japan says dumplings "cover-up" was China's request". Reuters. Retrieved 2008-08-07. ^ Richardson, Jill (August 7, 2008). "Is Your Organic Food Really Organic?". AlterNet. ^ MacArtney, Jane (2008-09-17). "3 babies dead, 6,000 sick as milk poisoning spreads in China". The Times. London. ^ Yan (1 December 2009). "Ministry: 6 infants possibly died of tainted milk powder". Xinhua. Retrieved 2009-08-15. ^ "又見黑心貨》珍奶好Q… 是塑膠！". 聯合新聞網. 2009-03-31. Archived from the original on 2009-04-01. Retrieved 2009-04-01. ^ "陝西饅頭滴農藥以增加口感". 中央日報. 2009-03-13. Archived from the original on 2011-07-25. Retrieved 2009-04-01. ^ "主廚爆料 泡羊尿鴨肉當羊肉". 中國時報. 2009-03-16. Archived from the original on 2011-10-07. Retrieved 2009-04-01. ^ "中國黑心商超多！拿乾黃豆染泡成青豆出售". NOWnews. 2010-03-28. Retrieved 2010-04-02. ^ "黑心青豆黃豆染製". World Journal. 2010-03-29. Archived from the original on 2013-04-28. Retrieved 2010-04-02. ^ Zheng, Caixiong. "Noodle makers in hot water". China Daily. ^ Shanghaiist (2012-10-12). "Contaminated strawberries from China infect over 11,000 children in Germany". Retrieved 2013-11-10. ^ Shanghaiist (2013-03-20). "Of course there were more pigs today, total now nearing 15,000". Retrieved 2013-11-10. ^ Shanghaiist (2013-03-26). "Illegal pig dealers in Zhejiang linked to Shanghai hog wash". Retrieved 2013-11-10. ^ The Ministry of Public Security (2013-05-02). "公安部公布十起打击肉制品犯罪典型案例". Archived from the original on 2013-07-24. Retrieved 2013-11-10. ^ Shanghaiist (2013-05-03). "Eaten hotpot in the last four years in Shanghai? You probably ate rat". Retrieved 2013-11-10. ^ Shanghaiist (2013-05-06). "Yum continues to fail to live up to its name, linked to fake lamb scandal (Update)". Retrieved 2013-11-10. ^ Natalie Ma (Shanghai Daily) (2013-08-24). "'Recycled' rotting meat snacks sold to public". Retrieved 2013-11-10. ^ JRJ (2013-09-13). "西安查获17吨假牛肉 用便宜猪肉制作". Retrieved 2013-11-10. ^ Shanghaiist (2013-09-14). "20,000 kilos of fake beef seized in Xi'an". Retrieved 2013-11-10. ^ Shanghaiist (2013-11-01). "Slaughterhouse near Shanghai pawns cat meat off as rabbit". Retrieved 2013-11-10. ^ Tom Phillips (The Telegraph) (2013-10-31). "Chinese police find slaughterhouse selling cat meat". The Daily Telegraph. London. Retrieved 2013-11-10. ^ a b "China food scandal spreads, drags in Starbucks, Burger King and McNuggets in Japan". Reuters. Retrieved 23 July 2014. This page was last edited on 23 April 2019, at 22:59 (UTC).